Facebook’s mysterious press event is underway, and the company just unveiled a new graph search feature on stage that aggregates granular results based on user engagement and interest and provides Bing-powered Web results. Many rumors indicated Facebook would unveil a new search function that would rival Google and likely introduce a better way to browse through the social network. Facebook CEO Mark Zuckerberg revealed graph search is not just web search, though. People in a user’s friend network apparently rank results, while mutual friends and various “signals” sort other results in the Facebook network. There is even a “refine this search” option on the right that lets folks further narrow their results. 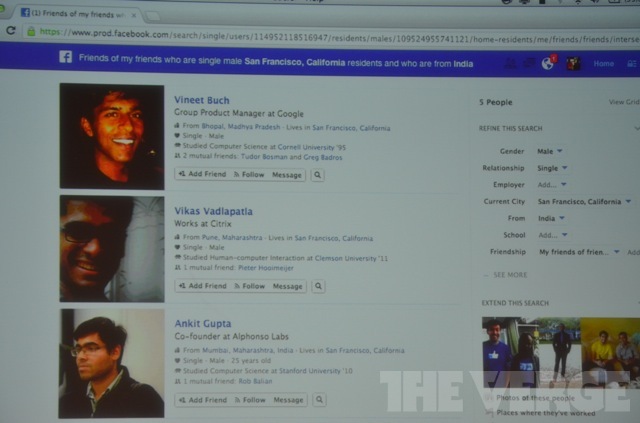 The graph search is in beta, Zuckerberg noted, and people, photos, places, and interests form the foundation. In today’s showcasing of graph search, a demonstration of Maps, refined by likes and location tags, was shown off, as well as an example of Places search, akin to Yelp, which showed a better way to find places via where friends have been and what they’ve liked, and Photos search. Engagement, likes, and comments apparently organize images, places, interests, and other searchable items. Meanwhile, a Search box serves as a “title for the page,” Zuckerberg added, and the content appears below it. He demo-searched for “Friends of friends who are single men in San Francisco and who are from India,” and a listing of related men and their Facebook profiles filled the search results. Kindle Fire HD review: Why can’t this just be an Android device? He also searched for “Photos of my friends taken in Paris, France” and “Photos of my friends before 1990,” and, sure enough, accurate results emerged. The feature seemed reminiscent of Google Image Search—but with photos from Facebook friends and others. Also, Facebook’s new search function can only search for content that’s shared or already public. “People are going to care about what shows up about them through search, so we have some great tools to answer that question,” Zuckerberg explained, and, from there, he panned to Facebook’s “Activity Log” and various privacy “shortcuts” that allow users to control their posts and what information is public. Facebook is rolling out the limited beta today at Facebook.com/graphsearch. Also, Zuckerberg said Bing will power Web search within the beta as normal blue links for things like Weather and other items it hasn’t indexed yet. More information is available at Facebook’s Newsroom website.